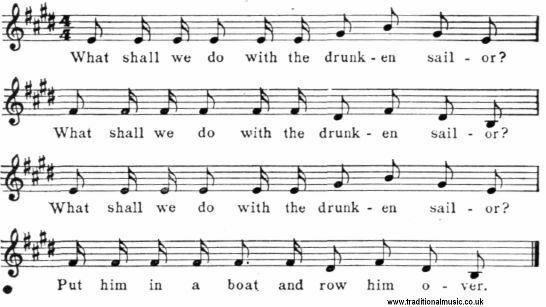 What shall we do with the drunken sailor? What shall we do with the drunken sailor? What shall we do with the drunken sailor? Put him in a boat, and row him over. Prof. C. H. Hall, Franklin, Ind. b. Longways dance for any number of couples above three. The same figures are danced to this as to "Weevily Wheat" but the order in which these are taken is left to the leader of the game. d. Edwin F. Piper (Jour. Am. Folk-lore, vol. XXVIII, p. 277) prints this as a play-party song of two stanzas. This tune belongs to a very old form of song, and is related to what is known today as the ''round."